This sprawling 70-room resort set on the headland at the northern edge of the beach is the cheapest option on Laem Thong, with a wide range of room sizes and styles. Ad Book now! Rates from US$61.49++. Average rating 7.9 from 1,220 reviews. 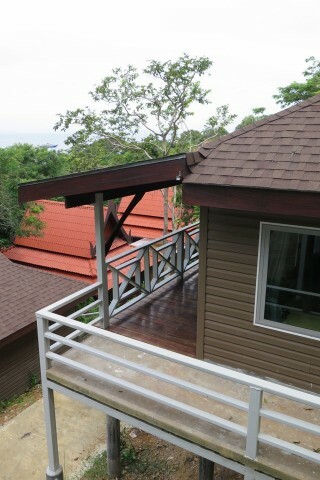 We had a peek at their new bungalows, dubbed superior villas, which at the time of our visit were not yet listed online. These concrete duplex bungalows set high on the hill lack character but the rooms are modern and spacious with double beds – families could book the connected rooms. The opening rates on these villas (in August 2014) are great value, priced the same as the standard rooms – but we’re not sure how long these will last. Getting up to these, as well as the nearby standard rooms set in a hotel-style building, is a long, steep walk, but the resort provides transfer by pickup truck till 23:00 We were told that there are two "private" beaches at the base of the hill below the new villa bungalows but we didn’t venture down to check it out. The resort has two pools, one near the entrance and one in the courtyard of the standard room building, plus five two-bedroom villas have private pools. The resort also has a range of bungalows for two to six guests, but we were not able to look inside any of these as they were full during our visit. We found the staff here to be friendly and helpful. All rooms have minibars, hot water, air-con and safety boxes. WiFi is available in the lobby only. Given how busy they were in low-season August, we expect advance bookings would be essential here nearly year round. Much better rates are available online. Check rates at Phi Phi Natural Resort on Booking.com.